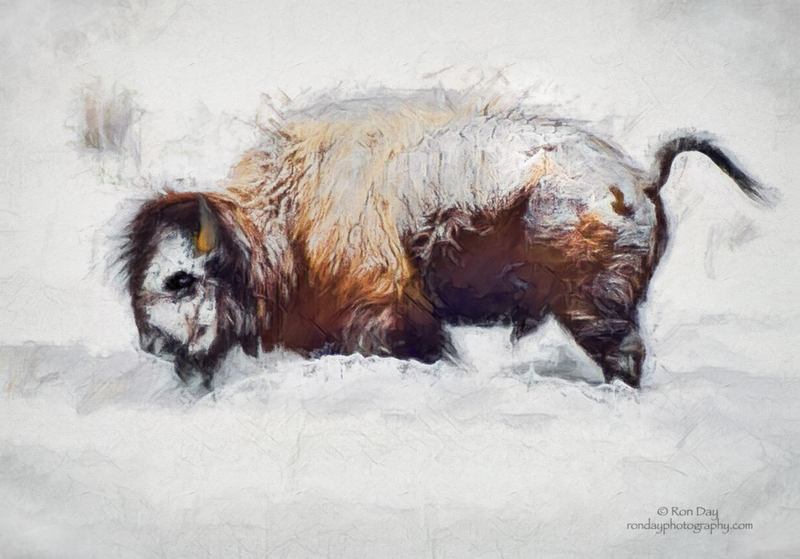 American Bison photographed at Yellowstone National Park and painted with Topaz Impression II. Please click on image to view it full size. Thank you. Looks very cold! I very much like the use of the abstract painting effect for this image. Thanks, Dean. I was working towards an abstract. Appreciate your input. What terrific textures you've created, Ron- the chunky whites look sooo icy. This rendition makes me think of origami a bit, at least in the foreground. A wonderfully effective painting that really gets the message across. Works well as a dynamic abstract as well. Very cool!! Thanks, Cindy. Started as impressionistic then pushed it a little towards the abstract. Appreciate your input and the pun. Thanks. Like all good images, it evokes a strong feeling! I think I’ll go put on my down parka and boots now! Brrrrr! Amazing! The colours, subject, pose and primitive style remind me of the up to 20,000 year old Lascaux cave paintings which were discovered in the Dordogne region of France. Some of the 600 prehistoric animals are painted in very similar colours with the red, black and white and the head down, tail up pose is so like the style used in some of the cave art. A very evocative image, Ron! Carol and Dave, I researched the Lascaux cave paintings and definitely see and appreciate the similarity. Thank’s for your input. A stunning work of art Ron,the textures you have created are amazing. Thank you for the kind words, Peter. Your input is greatly appreciated. Agree with Carol. When I first saw this I thought of a cave painting. It's amazing what can be created out of a photographic image. Really well done. LOL . . . . . Thanks, Lynn. Made my day!!! Thanks to the moderators and NatureScapes for the EP — it is greatly appreciated.